This is another simple coaxial cable, in this case using a fairly heavy-duty multi-stranded core of plain copper, a fairly thick polythene insulation, braided copper screen and soft PVC jacket, with an overall diameter of seven millimetres. 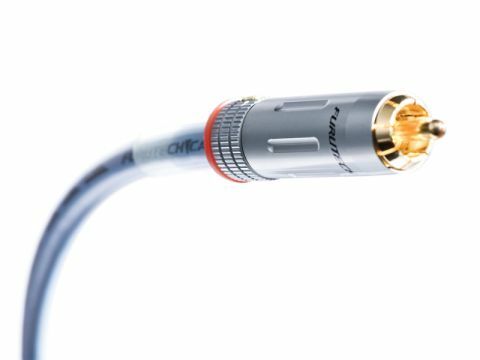 That basic description could apply to any number of cables on the market, but Furutech applies its own unique feature in the shape of 'Alpha U-OFC' copper. This is particularly pure copper that has been treated in a two-stage cryogenic process and also demagnetised using a specific process which is claimed to give more complete demagnetisation than normal treatments. Both the cryo and demag stages allegedly improve conductivity, although not by all that much and indeed the whole business of demagnetising non-magnetic materials (including copper) is still controversial. The phono plugs are locking types, a nice touch at this price. There's no denying the superb detail that can be heard through this cable, a characteristic plainly preserved in various applications. But we couldn't help feeling that this was occasionally achieved at the expense of the bigger picture, the sound seeming a little dissected now and then. Unusually, given the frequent correlation between detail and imaging, spatial information is not remarkably well presented: there's a decent sense of instruments' location but no really solid picture presented of them, or of the space around them. Tonally, this cable is generally neutral, with just a touch less bass than some might like but no serious lack, while treble is very clear. Rhythmically it is precise, though again there seem to be more trees than wood.